Special Containment Procedures: The first recorded appearance of this phenomenon is dated 19██, filed in Foundation records as an Extranormal Event. However, at least ten repeat-occurrences have since been verified, precipitating numbered status and close observation. 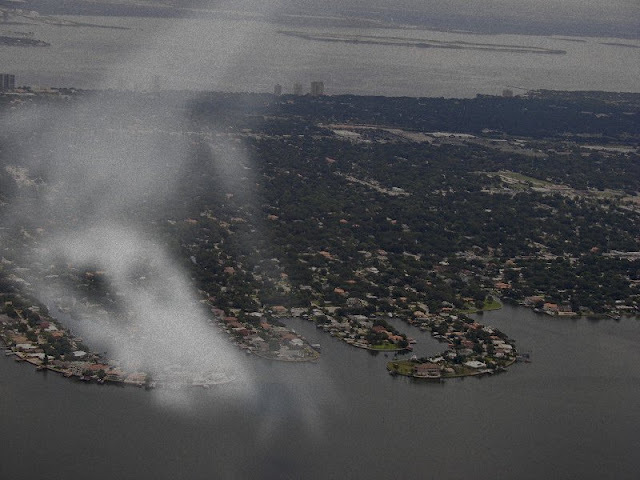 Description: SCP-1108 is a meteorological phenomenon which has only been observed along the southeast coast of the United States, recurring most frequently along the east coast of Florida. Most observers at ground-level experience SCP-1108 as a heavy fog, with no evident anomalous properties. However, from an elevation above or approaching 450 m the formation reveals a distinct shape. Based on aerial photographs and the surrounding ecosystem, this shape is best described as resembling Alligator mississippiensis, the American alligator. In ideal conditions, the anomaly appears in enough detail for eyelids, teeth and individual scutes to be clearly identified. Aerial and even peripheral observation indicates that the vaporous mass even moves its "limbs", albeit slowly, mimicking the reptile's distinctive gait. SCP-1108 most frequently appears a few hours before dawn, often emerging from an existing cloud-bank at a dew point and temperature consistent with fog formation. This "gator formation" will maintain its distinct size and shape for upwards of six hours. During this six hour period, SCP-1108 traverses an area of approximately 50 km length, always toward the bordering Atlantic. The form appears to gradually dissipate into the atmosphere. The effects on the local ecosystem do not become apparent until after the formation's departure. These apparent influences have so far included an irregular rise in fresh water levels and an abnormal displacement of local wildlife. Specifically, in areas directly overshadowed by SCP-1108's passage, adult Alligator mississippiensis have been found congregating in the dozens. The infestations occur far from areas highly populated by the native reptile, which appear in greatest numbers on private property and suburban developments, favoring swimming pools. 37 reports of juvenile and adult American alligators on private property. Woman reports adult male alligator inside of her kitchen; local media reported specimen's length as 4.3 m.
6 reports of alligators attempting to enter homes; while behavior not unprecedented, number of instances highly abnormal. Three non-fatal attacks of alligators on humans, one resulting in significant injury. One fatal attack of juvenile male alligator against adolescent. 18 reports of missing pets. The Florida Water Management District recorded an average of 16.5 cm rise in drainage canal levels, despite the lack of precipitation. As the majority of the southern portion of the state is kept above waterline by an extensive network of such drainage canals, any significant rise in freshwater levels could cause significant damage to populated areas. Local wildlife control had sufficient manpower to prevent undue fatalities; however, it is unlikely that state budget or resources could adequately contain repeat occurrences. It is unknown at this time whether the intrusion of Alligator mississippiensis was a displacement of existing creatures, or indicative of a significant population increase. Necessary information-control protocols were enacted without incident. Addendum 7/1/██ As of 6/21/██, SCP-1108 has made two consecutive appearances. Only the second was accompanied by an influx of Alligator mississippiensis; however, the rise in water levels mandated flood-evacuation in two counties. The extent of possible infestation of Alligator mississippiensis in flooded areas cannot be determined, at this time. Addendum 7/9/██: During the most recent occurrence, field researchers reported a previously unrecorded phenomenon— described as "a series of low, drawn-out rumbles", which were sustained over several hours. Radiometric measurements taken during the course of these observations do not indicate temperature changes conducive to creating lightning. However, the subsequent recordings do bear a striking resemblance to the male alligator's bellow. 1. Containment proposals should be submitted to Dr. Dhara for review.